Tunic made of black knit and metallic silver "chainmail"
Hood is made of metallic silver "chainmail"
When a dragon attacks the village, who will the people turn to? When a horde of goblin warriors are knocking on the castle gates, who will protect the kingdom? When the King and Queen require a hero to uphold the strict code of chivalry, who will the call upon? Why, your little girl, of course! It might take a bit of training and she may have to eat all of her vegetables, but your little girl may just have what it takes to become a knight. She’ll have to hone her skills with the sword and conquer the broccoli that’s on her dinner plate, but once she’s finished both, she’ll be ready to don the outfit of a true chivalrous knight. 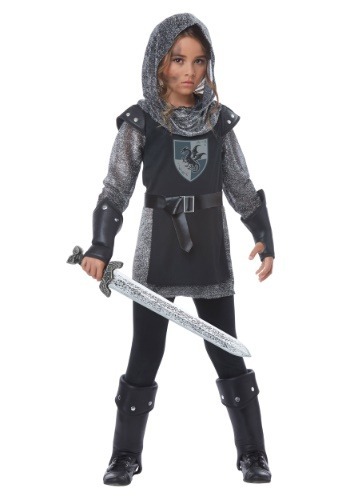 She’ll be ready to wear this noble knight costume for girls. This kid’s knight costume combines the classic look of knights with a new sensibility that should have your child feeling like the hero of a Renaissance adventure. Much of the top has the look of chainmail armor and it even comes with a hood to help her look ready for battle! The faux leather shoulders also add a medieval vibe, perfect for any girl trying to become the new defender of a kingdom. Once you’ve decided on turning your little girl into a knight, be sure to grab a few toy weapons, since you’ll want to keep your girl fully prepared with a sword and shield for that army of imaginary angry goblins looking to invade your home!